Talmudist, physician, and scientist; born at Shklov, White Russia, about 1740; died about 1812. He was one of the old-style Jewish scholars, more common in the Middle Ages than in the eighteenth century, in whom piety and rabbinical learning were combined with thorough scientific training. Baruch, descending from a family of scholars, was educated for rabbi and received the "semiḥa" (ordination) from Rabbi Abraham Katzenellenbogen of Brest in 1764. He afterward became a dayyan in Minsk, but a craving for knowledge impelled him to leave his native country and visit the great seats of learning in western Europe. He studied medicine in England; and his "Ḳeneh ha-Middah," on trigonometry (Prague, 1784, and Shklov, 1793), is a translation from the English. He was in Berlin in 1777, where he published his "'Ammude Shamayim," on astronomy, with an appendix, "Tiferet Adam," on anatomy. He found at the house of Rabbi Hirschel Levin of Berlin a defective manuscript copy of the "Yesod 'Olam," by Isaac Israeli, of the fourteenth century, and published it there with his annotations in the same year. His booklet, "Derek Yesharah," on hygiene, appeared in The Hague in 1779, and his Hebrew translation of six books of Euclid was published there in the following year. In his later days Baruch found, for a few years, a refuge in the mansion of Court Councilor Rabbi Joshua Zeitlin, the great government contractor. Zeitlin, who was himself a distinguished Talmudical scholar, assembled about himself in his palace in Ustye, near Cherikov, in the government of Mohilev, White Russia, a group of rabbinical and secular scholars; and Baruch, who was his townsman, had there a separate room in which he established a chemical laboratory and made various scientific experiments. 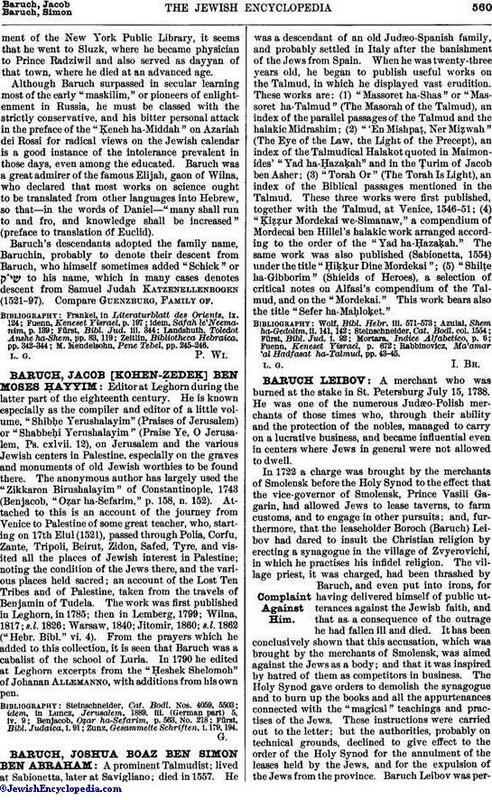 Baruch left Ustye some time before 1812 (see Fuenn, "Kiryah Ne'emanah," pp. 277, 278), and from a manuscript note by his grandson Censor Margolin on a copy of the "'Ammude Shammayim" (see Maggid, "Geschichte und Genealogie der Günzburge," St. Petersburg, 1899), in the Jewish departmentof the New York Public Library, it seems that he went to Sluzk, where he became physician to Prince Radziwil and also served as dayyan of that town, where he died at an advanced age. 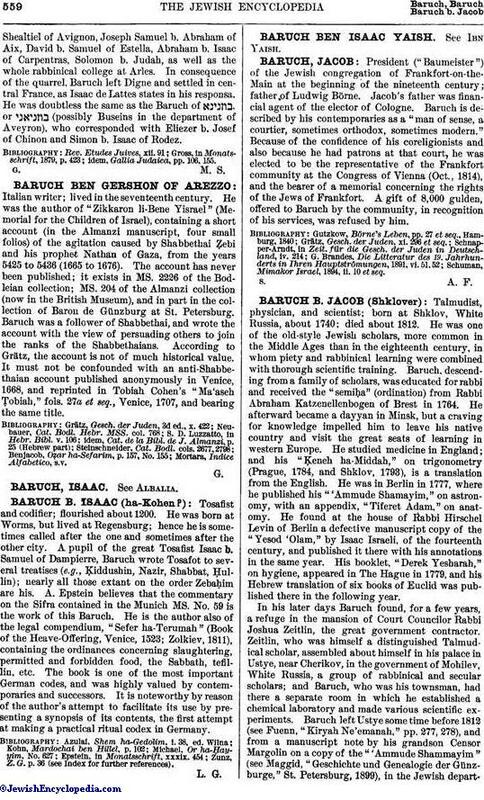 Although Baruch surpassed in secular learning most of the early "maskilim," or pioneers of enlightenment in Russia, he must be classed with the strictly conservative, and his bitter personal attack in the preface of the "Ḳeneh ha-Middah" on Azariah dei Rossi for radical views on the Jewish calendar is a good instance of the intolerance prevalent in those days, even among the educated. Baruch was a great admirer of the famous Elijah, gaon of Wilna, who declared that most works on science ought to be translated from other languages into Hebrew, so that—in the words of Daniel—"many shall run to and fro, and knowledge shall be increased" (preface to translation of Euclid). Baruch's descendants adopted the family name, Baruchin, probably to denote their descent from Baruch, who himself sometimes added "Schick" or to his name, which in many cases denotes descent from Samuel Judah Katzenellenbogen (1521-97). Compare Guenzburg, Family of. M. Mendelsohn, Pene Tebel, pp. 245-246.